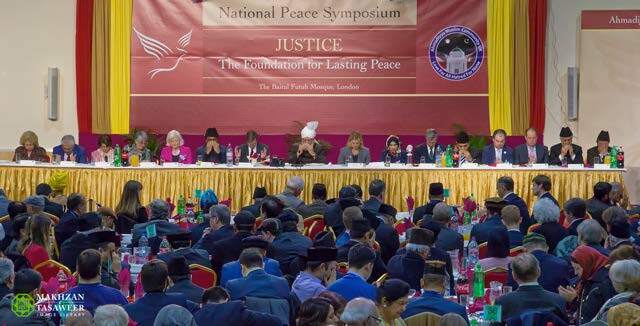 Keynote Address delivered by Hazrat Mirza Masroor Ahmadaa, Khalifatul Masih V, Head of the worldwide Ahmadiyya Muslim Community on 19th March 2016 at 13th Annual Peace Symposium UK held at the Baitul Futuh Mosque in South London. “All distinguished guests, Assalamo Alaikum Wa Rahmatullahe Wa Barakatohu – peace and blessings of Allah be upon you all. First of all I would like to take this opportunity to express my sincere gratitude to all of our distinguished guests who have accepted our invitation and joined us here this evening. Your attendance is particularly noteworthy given that this event is taking place at a time when widespread fear of Islam is on the increase due to the horrific and disgraceful acts of terrorist groups. For example, last November, the world watched in horror when the terrorist attacks took place in Paris, and apart from this, there have been suicide bombings and attacks in various countries at regular intervals. In terms of the United Kingdom, very recently the Assistant Commissioner of Police warned that Daesh was planning “enormous and spectacular” terrorist attacks here in the UK, targeting high-profile and public places. Furthermore, there has been a sudden influx of refugees into Europe during the past year and this is causing a degree of fear, uncertainty and even panic in the minds of many people. In light of all of this, your attendance and willingness as non-Muslims, to attend an event organised by a Muslim community, proves that you are courageous, tolerant and open-hearted people. Nonetheless, the simple truth is that there is no need for anyone to fear true Islam. Whilst some people claim Islam to be a religion of extremism and one that promotes suicide attacks or other forms of terrorism, nothing could be further from the truth. Recently, a well-known English columnist wrote about the rise of ‘Islamophobia’ in a national newspaper. He wrote that he had done extensive research on suicide bombings and found that the first such attack took place in the 1980s, despite the fact that Islam had existed for well over 1300 years. He concluded that if Islam permitted or encouraged such attacks then they ought to have occurred from the outset of Islam and throughout its history. His point was valid and very well made and proved that such attacks were a modern-day evil, far removed from the true and peaceful teachings of Islam. Certainly, Islam has very clearly prohibited all forms of suicide and so there is no justification whatsoever for suicide attacks or any other forms of terrorism. Such heinous acts lead to the murder and barbaric slaughter of innocent women, children and other members of the public. A recent research article by Dr. Considine of Rice University, in Houston, Texas, clearly says that the persecution of Christians in the so-called Islamic state is not justified by Prophet Muhammad’ssa writings. It further states that the Prophet’ssa vision of a Muslim nation was one of religious pluralism and civil rights. Thus let it be clear that such acts are absolutely contrary to Islamic teachings. If Islam has ever permitted warfare, it is only to the extent of a defensive war, where war has been forced upon you. For example, in chapter 22, verse 40, of the Holy Qur’an, Allah the Almighty has said that permission for warfare is given to those people upon whom war has been forcibly imposed. In that same verse, Allah the Almighty said that in the case of religious warfare He would help and support those who had been wronged. In early Islam, the wars that took place were genuine religious wars fought for the sake of upholding the fundamental principle of universal religious freedom. History proves that the wars fought with this intention made Muslims victorious, regardless of the fact that a handful of unequipped Muslims fought against huge, well-equipped armies. However, as a Muslim, when I analyse the wars involving Muslims today, I am certain that they cannot be classed as religious wars. For one, most of the wars taking place in the Muslim world are either internal civil strife or with the neighbouring Muslim countries. Secondly if ever non-Muslim countries are involved, they have never declared the war as religious and rather helped both sides of Muslims. Thus present-day wars are not being fought for the sake of Islam or for the sake of religion, but are for economic or geopolitical gains and are proving only a means of defaming Islam’s name. And so based upon what I have just said, I hope it is now clear that there is no need to fear Islam and that it is not a religion of extremism or one that permits suicide attacks or indiscriminate violence. There is no need for ‘Islamophobia’ because Islam’s true teachings are of peace, tolerance and mutual respect. Islam’s teachings are of upholding human values and protecting the honour, dignity and freedoms of all people. Thus, when Allah the Almighty is the Provider and Sustainer of all people and Gracious, Ever-Merciful, how could it be that He desired for those who believed in Him to mercilessly murder, violently oppose or harm His Creation in any way? Of course the answer is that it is not possible. Nonetheless, Allah the Almighty has certainly permitted for action to be taken to stop cruelty, inhumanity and injustice. Islam states that a Muslim should seek to stop the hand of an oppressor and to end all forms of injustice and transgression. According to Islam there are two ways in which this can be achieved. Firstly, it is far better if peace can be attained through mutual dialogue, negotiations and diplomacy. However, where this is not possible, only then force may be used in order to stop wrongdoing with the intention of establishing sustainable peace. Guest speakers at the symposium included, from left to right: London mayoral candidate and Richmond Park MP Zac Goldsmith; Lord Tariq Ahmad of Wimbledon, Minister for Countering Extremism; Ra q Hayat, National President of the Ahmadiyya Muslim Community UK; Siobhan McDonagh, MP for Mitcham and Morden, and Chair of the ‘All Party Parliamentary Group for the Ahmadiyya Muslim Community’; and the Rt. Hon. Justine Greening, MP for Putney and Secretary of State for International Development. Outside of the religious context, in every society and nation, there are rules and laws that exist and if they are violated then punitive action is normally taken. If it is possible to reform without punishment or with just a mild sanction or reprimand, that is better; however, if that is not possible then severe punishment is duly discharged for the benefit of the wider society and as a means of deterrent to others. Moving to a religious context, according to Islam, punishment or sanction is permitted not as a means of revenge or retribution, but only as a means of ending cruelty or persecution and as a means of positive reformation. The Holy Qur’an has said that if a person or group can be rehabilitated through forgiveness and mercy then this method should be adopted. However, if clemency or forbearance does not prove effective then punishment should be administered as a means of reformation and improvement. Therefore the philosophy underpinning punishment in Islam is extremely far-sighted and quite unique. Its purpose is to reform, rehabilitate and improve. It is to develop the highest standards of human values amongst mankind so that, by adopting the Attributes of their Creator, all people come to respect and care for one another. Therefore, where the rights of an individual or group are unjustly usurped, Islam permits punishments that are proportionate to the crime, however it remains the case that if reformation can be achieved without sanction it is preferable. This is why Allah the Almighty has said in chapter 24, verse 23, of the Holy Qur’an that it is better to forgive and to manifest forbearance. Similarly, in chapter 3, verse 135, Allah the Almighty has said that those who suppress their anger and who forgive and forget are those whom Allah loves and prefers. Furthermore, at many other places in the Holy Qur’an, it is stated that a person should forgive wherever possible, because the ultimate purpose is always moral reformation, rather than vengeance. In terms of conflict between nations or groups, Allah the Almighty has given a golden principle for the establishment of long-lasting peace in chapter 49, verse 10, of the Holy Qur’an. In the verse, it states that if there is a dispute between nations or groups, third parties should seek to mediate and to bring about a peaceful resolution to the conflict. In the event of an agreement, all parties should act equitably, but if either party contravenes the settlement and takes aggressive measures, then the other nations or groups should unite together and even use force if necessary to stop the aggressor. However, once the aggressive party withdraws and adopts peace they should not be unduly restricted but should be permitted to move forward as an independent nation and a free society. Therefore, as the Provider and Sustainer of all of mankind, Allah the Almighty desires for all people to live together in peace and to be free from all forms of persecution and injustice. In terms of belief, Islam enshrines the principles of universal religious freedom and freedom of conscience. According to Islam, every person not only has the right of freedom of belief, but also has the right to peacefully propagate their beliefs. Faith is, and always will be, a matter of the heart and so there should never be any form of compulsion in religion. Whilst Allah the Almighty has deemed Islam to be a complete teaching, no one has the right to forcefully convert others to it. Anyone, whether religious or not, is free to accept Islam, but the key point is that it should be accepted freely and entirely of one’s own volition and choice. Similarly, if a Muslim decides that he wishes to leave Islam, then, according to the teachings of the Qur’an, he or she has the right to do so. Whilst we believe Islam to be a universal religion and a timeless teaching, if anyone chooses to leave it then that is their choice and prerogative. In chapter 5, verse 55, Allah says that if anyone wants to leave, let them go. He will replace them with better and sincere ones. No government, group or individual has a right to punish them or sanction them in any way. Thus, the allegation that Islam mandates punishment for apostasy is entirely unjust and without foundation. Therefore the teachings of Islam all revolve around Allah and His Being and the fact that He is the Sustainer and Provider for the entire universe. Consequently, if a Muslim seeks to inflict merciless cruelties or to indulge in any forms of extremism then they will have to reject God’s Attribute of being the Sustainer of all of mankind. Alternatively, it may be that certain Muslims accept Allah to be the Master of the Universe and the Sustainer of all the Worlds, but have not truly comprehended the meaning of this and have consequently moved far away from Islam’s original teachings. Hence, it was to enlighten and educate mankind of the true Islam that we, Ahmadi Muslims, believe that Allah the Almighty sent the Founder of our Community, as the Promised Messiah and Reformer of the Age. The Founder of the Ahmadiyya Muslim Community states that in this verse Muslims are commanded by Allah to be just and fair towards all others. Therefore, Muslims are commanded to be kind and to extend favour to all other people, including those who have not been sympathetic to them or favoured them in any way. Finally, he explained that the verse required a Muslim to love God’s Creation to such an extent that they considered every person in the world to be like their own close family member. In fact, he said that a true Muslim should love others, irrespective of their background or belief, in the same way that a mother loves her child. Certainly, this is the highest and purest form of love because in terms of the second stage, where a person exhibits kindness or favour, it is possible that an element of self-projection remains, whether covert or overt, and at some point, the individual may remind the person of their gesture and seek favour in return. However, a mother’s love is truly selfless and altruistic and her unique bond with her child is such that she is willing to sacrifice everything for the sake of her offspring. She desires nothing in return and nor does she require any form of praise or tribute. Therefore, this is the ultimate standard that Islam advocates, whereby Muslims are taught to love all of humanity as a mother loves her child. These are the true teachings of Islam. Allah the Almighty has said that those who believe in Him should adopt His Attributes and so it is impossible for a true Muslim to be cruel and it is similarly impossible for Islam to permit any form of injustice, violence or extremism. Over the years, I have made these points time and time again and have highlighted these core Islamic teachings. I have repeatedly quoted the Holy Qur’an to prove that what I am saying is based on Islam’s authentic teachings. However, it remains that our peaceful and inclusive message is not covered extensively in the media, whilst on the other hand those relatively few people involved in brutality and carnage are given non-stop worldwide media coverage and attention. There is no doubt that the media plays a huge role in influencing public opinion and so the media should use this power responsibly – as a force for good and as a force for peace. It should show the world what true Islam represents, rather than focusing on the merciless acts of a minority. Publicity is the oxygen sustaining most terrorist or extremist groups and so I have no doubt that if the media takes on board what I have said we will soon find that the terrorism and violence afflicting the world will begin to die away. Personally, I cannot comprehend how the extremists who have plagued Islam and violated its noble teachings can seek to justify their hateful acts in its name. Islam’s teachings of peace prohibit all forms of extremism, to the extent, that even in a state of legitimate war, Allah has commanded that any action or punishment should remain proportionate to the crimes committed and that it is better if patience and forgiveness is manifest. Thus, all those so-called Muslims who are engaged in violence, injustice and brutality are inviting God’s wrath and anger to their doorstep. At a time when fear of Islam is ever increasing, let me stress again that the Holy Qur’an has repeatedly enjoined love, compassion and benevolence. If in certain extreme circumstances the Qur’an permitted defensive warfare, it was only in order to establish peace. Today, we observe that the majority of governments or groups, whether Muslims or non-Muslims, involved in warfare also claim that they are fighting for the sake of establishing peace. In terms of perception, it seems that most people are willing to overlook the wars conducted by certain world powers or at least not affiliate their actions to any religion or belief. However, as we live in a climate in which Islam’s teachings are being targeted, we see that all cruelties or wars carried out by Muslims are immediately linked to the teachings of Islam. Yet the voices of those people and those groups who are earnestly striving to spread Islam’s true and peaceful teachings are not being heard and not being widely publicised. In my opinion this is unjust and extremely counter-productive. At a time of worldwide conflict, we should remember this basic principle that it is better for all forms of evil and cruelty to be suppressed and for all forms of goodness and humanity to be endorsed. In this way, evil will not spread far, whilst virtue and peace will spread far and wide and adorn our society. If we promote the good that is happening in the world, we can overcome those who seek to undermine our cherished values of mercy and humanity. Yet the world does not seem to have accepted or understood this principle and that is why the media continues to prioritise its circulation or viewing figures over and beyond the peace of the world. The media, which gladly focuses on the tiny minority involved in brutality, are feeding the propaganda machines of evil groups such as Daesh, yet they fail in their duty to highlight all that is good in the world. In my opinion, this was an extremely insightful comment, yet the world’s major powers have continued to prioritise regime change in countries that were previously relatively stable. For example, the West was determined to remove Saddam Hussein from Iraq and the painful consequences of that war 13 years ago continue to be felt to this day. Another prominent example is Libya, whereby President Gaddafi was forcibly removed from office in 2011 and ever since Libya has spiralled into a state of lawlessness and unbridled chaos. A direct consequence of the political vacuum in Libya has been the fact that Daesh has now built a significant base and terror network in the country, which it is continuing to strengthen. The situation is now extremely dangerous, not only for the region, but also for Europe and this is something that I warned of some years ago. Therefore, the priority in such countries should not be regime change for the sake of it. Rather, it should be to ensure that the members of the public are given their due rights and for long-term peace to be established. Going back to Syria, I agree with the Austrian Foreign Minister when he says that the overriding objective should be to establish peace. Hence, the major powers should be willing to open the channels of communication with Syria’s Government and to seek the help of other neighbouring countries that have influence in the region. Remember, positive change is only possible if one is willing to set aside their personal interests for the greater good and is willing to act fairly at all times. As I have already said, Islam says that justice is the foundation upon which peace is built. And so we must pay heed to the urgent issues of our time. For many years I have warned that the world is moving rapidly towards another world war and now others are reaching the same conclusion. In fact, some prominent people are now saying that they believe that a world war has already begun. Nonetheless, I believe that we still have the time to stop such a war in its tracks but the solution remains, as I have already said, to act with justice and to leave aside all vested interests. On a number of previous occasions, I have spoken about the critical importance of cutting the funding and supply lines of extremist groups. Yet it cannot be said that full efforts are being made in this regard. For example, a recent special investigative report published by The Wall Street Journal stated that Daesh was acquiring huge quantities of U.S. dollars from auctions being held by Iraq’s central bank. Those same dollars were being provided to Iraq directly from the Federal Reserve in the United States. The article stated that the U.S. Government had known about this since at least June 2015, but personally I believe that world powers knew about such trading for much longer. Daesh acquires dollars from the Federal Reserve Bank through Iraq’s central bank. We can defeat these terrorist groups more quickly if we cut the funding o at the source. Therefore, whilst it is claimed that all possible efforts are being made to eradicate terrorism and extremism, the evidence does not substantiate this claim. Given all of this, how can it be said that there is true justice in the world? How can it be claimed that honesty and integrity are considered paramount? Similarly, recently there has been widespread media coverage documenting the global arms trade. According to official reports last year the United States exported weapons worth $46.6 billion dollars, which was an increase of more than $12 billion dollars from the previous year. It was further reported that the majority of those weapons were sold to countries in the Middle East and in turn they were fuelling the wars in Syria, Iraq and Yemen. I reiterate that if such trading is taking place, how is it possible for justice and peace to be established? These few examples I have cited are all in the public domain and are the views of respected analysts and commentators. Until principles of justice are exhibited at all levels of society and between nations we will not see true peace in the world. Without justice it could take decades to defeat the evil that is Daesh and other extremist groups. However, if the world heeds this message and comes to manifest justice and genuine efforts are made to restrict the funding and supply lines of terrorism then I believe – unlike a retired American military general who recently said the war against Daesh will last between 10 and 20 years – that the networks of terrorism tormenting the world can be destroyed imminently. 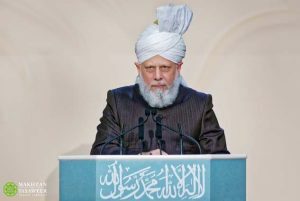 In conclusion, it is my belief that unless the world comes to recognise its Creator and accepts Him as the Sustainer of mankind, true justice cannot prevail. Not only will true justice not prevail, but we will also experience a lethal nuclear war whose catastrophic consequences will be faced by our future generations. I pray that the world comes to understand this reality. I pray that we all play our respective roles in furthering the cause of humanity. And I pray that true peace, based upon justice, is established in all parts of the world. With these words I would like to once again take the opportunity to thank all of our guests for joining us this evening.